A new study involving the work of Dr. Kevin Weng of the Virginia Institute of Marine Science uses tracking data for 14 species of migratory marine predators—from great white sharks to leatherback turtles and blue whales—to show how their movements relate to the geopolitical boundaries of the Pacific Ocean. 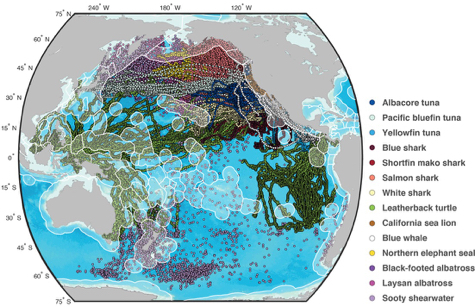 The results, published in the latest issue of Nature Ecology & Evolution, provide critical information for designing the international cooperative agreements needed to manage these species on the high seas, known as the “Wild West” of the ocean and among the least protected areas in the world. Indeed, Dr. Autumn-Lynn Harrison, the paper’s lead author and a research ecologist at the Smithsonian Migratory Bird Center, will present the study’s findings this week during the United Nations Intergovernmental Conference on Sustainable Use of Marine Biodiversity. 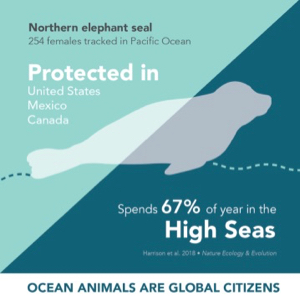 The U.N. General Assembly convened the meeting to promote management of marine areas beyond national jurisdiction and explore international collaborations for protecting species that travel through these remote waters. Weng, an assistant professor at VIMS, contributed to the multi-author study primarily while a graduate student, deploying satellite tags to track the migratory patterns of sharks. Harrison led the study in collaboration with colleagues at the Smithsonian Conservation Biology Institute, as well as with scientists at the University of California, Santa Cruz; Stanford University; NOAA; VIMS; and other partner institutions. The study used data from the Census of Marine Life’s Tagging of Pacific Predators (TOPP) project, one of the most extensive data sets available for marine species tracked with electronic tags. 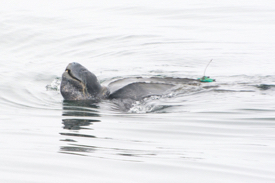 TOPP includes tracking data for white sharks, leatherback turtles, Pacific bluefin tunas, sooty shearwaters, California sea lions, and other species. Cumulatively, the 14 animals in the study visited the jurisdiction of 37 countries. 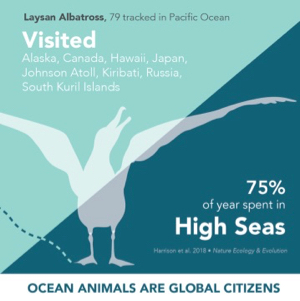 Some, including the threatened Laysan albatross, spent 75 percent of their annual cycles in the high seas. All of the species—even those that tend to usually stay close to the coast, such as the California sea lion—spent some time during their migration in the high seas, where they face mounting threats, including plastic pollution and overfishing, illegal fishing, and incidental bycatch of non-target species. 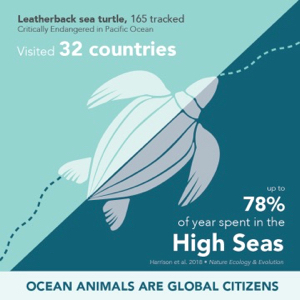 The leatherback turtle—one of the species that travels through the jurisdictions of the highest number of countries—is also the most critically endangered of those included in the study, and a priority species for the National Oceanic and Atmospheric Administration. Because they travel through more than 30 countries and the high seas, leatherback turtles highlight the need for multi-lateral, cooperative and international agreements to manage the species, according to the paper’s authors. Some of the species in the study only traveled through a few countries, making their management more straightforward. For those species, this study shows which countries need to collaborate on management decisions and when during the year those measures need to be put into place. The results will be used in new management plans, and in the coming months researchers will continue to share the information with international collaborators and the United Nations. A team of researchers, including Harrison, will next be broadening this work beyond the Pacific Ocean to provide the same kind of information for migratory species across other oceans, including the Atlantic. In addition to Harrison and Weng, the co-authors of the paper are founders of the TOPP project: Daniel Costa at the University of California, Santa Cruz (UCSC); Barbara Block at Stanford University’s Hopkins Marine Station; Steven Bograd at NOAA Fisheries; Arliss Winship at NOAA’s National Centers for Coastal Ocean Science; Scott Benson, Heidi Dewar, Peter Dutton and Suzanne Kohin at NOAA Fisheries; Michelle Antolos and Patrick Robinson at UCSC; Aaron Carlisle at University of Delaware; George Shillinger at Upwell; Sal Jorgensen at the Monterey Bay Aquarium; Bruce Mate at Oregon State University; Kurt Schaefer at the Inter-American Tropical Tuna Commission; Scott Shaffer at San Jose State University; Samantha Simmons at the Marine Mammal Commission; and Kristina Gjerde at the IUCN Global Marine and Polar Program.